Nearly two months before this year’s commencement, it was my privilege to welcome retired Gen. Stanley McChrystal to the UNH School of Law, where he spoke before a packed lecture hall about giving more young people opportunities to engage in public service. In his remarks, the general offered a convincing call-to-action to make a year of full-time, voluntary national service — a service year — available as a shared cultural expectation and civic rite of passage for every young American. “Over the next generation, we will need to come together to solve some big problems,” McChrystal said. “We’ll only do that if we have citizens who are well versed in working together across all the lines that divide us.” The four-star general added that programs such as the Peace Corps, City Year and Teach For America could be greatly expanded to give more young people the chance to work together in service. One of our goals in opening the Rudman Center for Justice, Leadership and Public Policy was to invite national thought leaders to New Hampshire to share their ideas. And with our first-in-the-nation presidential primary looming, UNH will be an increasingly popular venue for those seeking to spur a national conversation on key issues. But McChrystal’s appearance also found me reflecting on the ways in which we encourage UNH students to volunteer their time, talents and skills for the common good. Among our most notable examples is former U.S. Army Sgt. Ryan Pitts, who was awarded the Medal of Honor in 2014. We were honored to have Pitts, a 2013 graduate of UNH Manchester, as our commencement speaker in Durham this year. But before his name was ever in the headlines, Pitts was not unlike many veterans who return to college with a commitment to public service. At UNH Manchester, Pitts stood out as a student leader, as president of a student-run business club that assists local nonprofits and as a representative on the dean’s advisory board. When he graduated, he was presented the New Hampshire Award of Excellence for leadership, scholarship and citizenship. And this was more than a year before the Medal of Honor was announced. 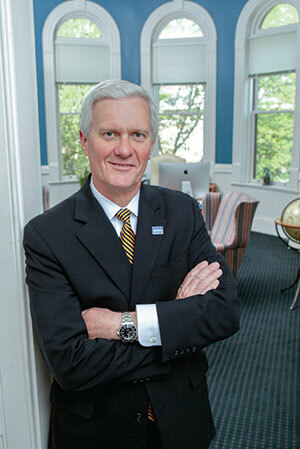 While Pitts’ contributions are exceptional, his willingness to volunteer defines a key characteristic of the UNH community: Wildcats take pride in giving back. In fact, the opportunities we offer in public service — well beyond any academic requirements — help us attract students to UNH. A study done several years ago indicated that more than 3,500 UNH students are active in volunteer work each year, logging nearly 90,000 hours with 20-plus organizations. The student-organized Relay for Life fundraiser is a shining example. This year, some 900 students from 40 student organizations were joined by staff, faculty, cancer survivors and caregivers at the Whittemore Center for the 24-hour walk-a-thon to benefit the American Cancer Society. Together, they raised more than $75,000. Relay for Life is just one of many volunteer opportunities our Office of Student Involvement and Learning helps facilitate. Here in New Hampshire, you can find UNH students tutoring at-risk elementary school students, working at homeless shelters and food pantries, assisting at animal shelters and with land conservation and organizing to welcome home combat troops landing at the Pease Air National Guard Base in Newington. Worldwide, UNH is also a leading contributor of Peace Corps volunteers, ranking ninth among medium-sized schools in the U.S., with 24 alumni currently volunteering across the globe. For some students, UNH plants the seed for what becomes a life of service, and this issue of UNH Magazine highlights three alums for whom that has been the case. John Marshall ’87 turned a year of volunteer work into a mission to serve orphans in India; Job Heintz ’90 parlayed a legal service year in Nepal into a health care outreach project; Christine Ieronimo ’92 adopted a daughter from Ethiopia and dedicated herself to supporting the village where she was born. Their stories are moving and inspiring — and just a sampling of the many ways our students and graduates are taking on major challenges facing our nation and the world and changing their own lives for the better in the process. As we celebrate the academic achievements of our new graduates, let us also reflect on the lifelong passion they developed here for public service — and consider the ways we can each become part of a national conversation to create more opportunities for young people to serve.